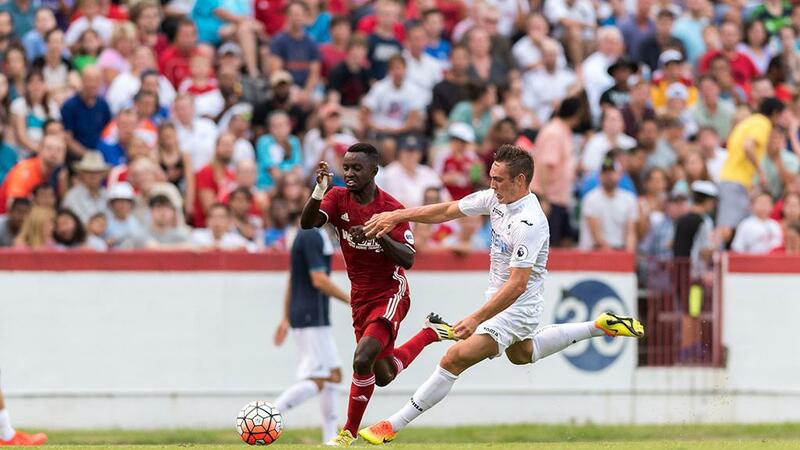 RICHMOND, Va. – The Richmond Kickers scored once in either half as they took a 2-0 victory in an international exhibition against the Premier League’s Swansea City A.F.C. at City Stadium in front of 7,128 fans on Saturday night. A first-half own goal and finish by Anthony Grant after the break gave the Kickers victory against their illustrious opposition. The Kickers got onto the front foot early, and had a chance in the eighth minute when Brian Ownby’s low shot forced a save from Kristoffer Nordfeldt. Four minutes later, though, the hosts took the lead as Swansea defender Jordi Amat turned Ownby’s cross into his own net to put the Kickers ahead. The Swans first good chance arrived in the 14th minute when Dan James cut in from the left side, but his curling shot went across the face of goal and wide. The visitors went close again 11 minutes later when Connor Roberts’ cross found Andre Ayew, but the Ghanaian international headed over the crossbar. Swansea threatened again eight minutes before the halftime break when Modou Barrow cut in from the right flank, but his effort flew high of the target. The game then went into a weather delay for more than 90 minutes, but the game resumed and the Kickers held the lead until the halftime break. The Kickers almost added to their lead four minutes into the second half when Anthony Grant got in behind the Swansea defense, only for goalkeeper Gerhard Tremmel to save. Swansea looked to respond, and both Oliver McBurnie and Jack Cork both went close with shots four minutes apart. Richmond doubled its lead with 16 minutes to go, however, as Grant made no mistake off a pass by Jackson Eskay. Swansea came close nine minutes later when McBurnie broke in on goal, but Kickers goalkeeper Travis Worra made a big save to deny him and close out the victory for the hosts.